Who doesn’t love some solid subwoofer action? Evidently my mother. Deep bass makes her nauseous. So I understand when she asks me to turn off the subs in my car when we’re cruising around town. Regardless, most of us have a passion deep in our soul for bass. A subwoofer provides one sole purpose; to create the rumble we love. However, each room is unique and your preference of sound should be considered while making the choice. How does the relationship between your speakers and subwoofer work? Subwoofers create a seismic experience that oscillates the ground beneath us and the guts within us. Our Intimus 5T tower speaker rolls off around 50 Hz, while our Verus Grand tower extends its roll off to around 40 Hz. Below this range is where a subwoofer lurks, capturing the deepest trenches of the sound field to ensure that you feel most alive during your listening experience. These sub sonic frequencies are a heavy load to burden, which is another advantage of having a self-powered subwoofer. 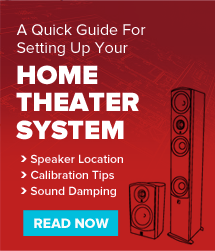 Although most AVR’s have an auto-calibration system, understanding your speaker’s frequency response will allow you to better fine tune your system. At no time should you lose trust in your own ears. Your speaker rolls-off at a certain point in the bass due to the physical capabilities of the drivers, hence the need for a sub. Typically a common crossover point between the speakers and subs is around 80 Hz. As your speaker rolls off in the bass range, your sub picks up the slack and handles everything below that point. Below 100 Hz is the range where the sound becomes non-directional. If you choose to run the Verus Grand towers at full range, then you might set your sub to a 60 Hz crossover since the towers can hang low. Back in 2009 I was working for a record label in Southern California. It was a quiet afternoon at the office when suddenly we felt a G-force like blast and the roof sounded like it was going to collapse. That happened to be a sonic boom from a space shuttle which landed at Edwards Air Force Base. The rumble of a subwoofer reminds me of a sonic boom, a visceral feeling rather than a single frequency pitch. Those deep sound waves are physically moving the air, which is why you feel the sound pressure level internally. Frequencies in the upper range are more easily recognized by the human ear and are typically much easier to put a “pitch” or “tone” to it. The interesting thing is that these tones or pitches are not a single frequency, but a blend of many frequencies. You can always take a tone generator to your speakers or sub and toggle by one hertz at a time but understanding that groovy bass lines in music and most detonations in movies cover a broad range of frequencies. Realizing your speakers and subs strengths in each area will help you set your crossovers from a knowledge standpoint and more smoothly blend your sound system together. Another entity about sound is that all records and movies are mixed and crafted sonically unique. What makes this special is that we, as individual humans, perceive sounds differently. For example, an experienced mix engineer has an extremely trained ear with high attention to detail. They also know how to manipulate a sound to achieve the tone they hear as best fit. They will pick out small anomalies in the sonic qualities that even one who is considered an audiophile may not pick up on. Music mixes usually start with the stereo field to check for balanced response across the front sound stage. From there they can mix it into a multi-channel or 5.1 sound field. Mixing each instrument or sound as to not interfere with each other’s tone and sound field are crucial for a clean mix. For example, Metallica’s …And Justice for All. The mix has zero bass guitar going through the sub. Literally the kick drum is the only thing occupying the subwoofers range which makes every kick feel like a gorilla is pounding on your chest. With this particular album, you may want to set your crossover between 70-90 Hz. A different example would be any album from Tool. Their music is heavily driven by the bass guitar using longer sustained bass notes. You still get a punchy kick drum, however opening the subs crossover above 120 Hz or even 250 Hz will unleash the full low-end sub sonic spectrum. Room acoustics have a huge impact on the response of subwoofers and speakers. Things like bass traps, absorption panels or carpet can help to neutralize unwanted reflections of sound and allow the pure sonic tones to envelop the room. The shape of your room can especially affect the overall sound and balance of your system. If your room is long, narrow and built from smooth concrete barren walls, you can expect a ton of reflection and reverberation. If the room was built with drywall, you will may notice some echo or flutter. If the ceiling is vaulted or a built as a drop/false ceiling, you’ll likely discover issues in the subsonic frequencies. For more examples of ways to improve your room sound, check out Steve’s article 5 ways to improve your room sound. Generally speaking the larger the space, the worse the bass. Is your ceiling vaulted? Will the sub go in a living room that opens to other rooms of the house? These are indicators that you may need a larger sub or multiple subs. Vaulted ceilings and wide open rooms will evaporate bass, causing you to feel underwhelmed by your subs performance. Placing a smaller sub in the corner or against a wall will help expel the bass to into the room. Whether your speakers are perfectly balanced on paper, or accent bass, mids, or treble, your sound preference is your own. Only your ears will determine and perceive what sounds best to you. Keep in mind that you can have the most incredible speakers imaginable in a poorly acoustically-treated room and the speakers will not sound up to their potential. On the flip side, you can have lesser grade speakers in a sonically treated room and they will sound decent. Surprisingly, subs can be “out of whack” with the full speaker mix. This can be corrected by following the process of Gain Staging (used often in live sound mixing) – where you have multiple points in the signal chain to adjust the volume. Hypothetically, if you’re having to crank your receiver volume knob above 80%, there’s a good chance that the individual volume settings for each speaker are too low and need to be adjusted within the receiver. Same applies for your sub. Inversely, if your sub amp volume is at the max and your receiver has the sub output to +12 dB, you’ll hear all sub and hardly any speaker. This could negatively impact your subwoofer driver by causing it to make unintended noise and bottom out, even if the rest of the speakers are playing at a moderate volume. The goal for Aperion subwoofers is to replicate a very well balanced and controlled bass response. We’ve heard subs from both worlds that can’t reproduce the desired effect, or that are flat out overkill during our favorite action movies. And while we definitely LOVE bass, we understand there is a balance of sound taking place in your room, with your speakers. We feel our Bravus line serves this purpose well and each model was designed for your preferred listening situation. We recommend our Bravus II 8D for music as it adds depth beyond your front speakers performance capacity. Our Bravus II 10D is great for both music and movies as it has a bit more low-end extension, but still maintains the punchy response of a smaller driver. The 12D is best fit for movies. It creates a full bodied sub sonic experience and handles the rigorous low end of action movies and sustained bass tones. So whether you’re a bass head like me, or simply love the complete sonic range that a well sized and placed sub can add to your music soundstage, subs more often than not, have a legitimate place as part of your sound system. 0 comment(s) Tag: Aperion, Aperion Audio, Audio Technology, best speaker placement, Gaming, Guru Tips and Tricks, Home Theater, Home Theater Blog, Home Theater Buying Guides, How to choose a subwoofer, Movies, Music, sub, subwoofer, subwoofer calibration, subwoofer setup, what size sub, what subwoofer do I need?